It’s a pretty gloomy day today, with rain in the forecast, but I’m planning to be cozied up with lots of tea and knitting! I’ve gotten pretty far on reknitting my sweater with bows – it’s nearly up to the armholes again, and I’m really happy I ripped. A cardigan version is going to get a lot more wear with me than a pullover, and since the nows are spaced one more plain row apart than before, it’s going quicker! 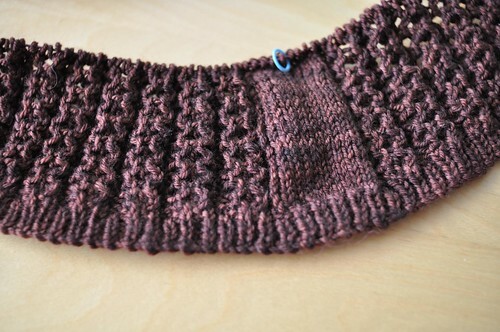 I also started a new sweater, out of that brown Dream in Color classy – this one is coming along really quickly. Worsted weight lace is super fun to knit. I’ve been feeling overheated more these days, so I thought the lace would be a good way to get some ventilation while still being nice and cozy. The real cold hasn’t actually settled in yet though, so who knows what’ll happen this winter. Love the brown lace… can’t wait to see what it grows up to be! Classy is great to knit with. I love dream in color classy, your sweater will no doubt be beautiful. Can’t wait to see it! you make drab-sounding grey and brown so pretty to look at. The new lace sweater looks fantastic. I’m sure it’ll be perfect for those fall days! Two sweaters at once…you are far better at multitasking than I am! How are you doing the bows in the gray sweater? 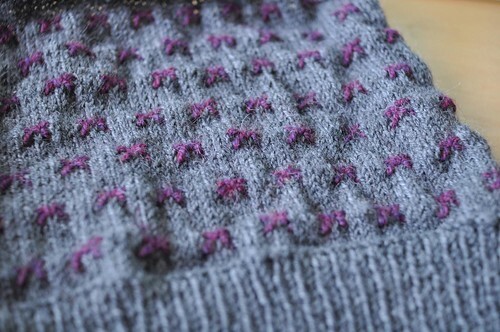 Seems like you have two gorgeous knits in the work!